If you’d like to learn how to safely preserve food, Carol is the one to call. Carol has trained many Master Food Preservers when she was affiliated with University of Illinois Extension and continues to provide research-based food preservation classes in Southern Illinois. Whether it’s a hands-on class where you and your friends learn the basics of making salsa or jelly, or a food preservation demonstration, you’ll be sure that what you learn is the correct and safe way to preserve foods for you and your family. Best of all you get to taste what you make in the class or what Carol demonstrates! 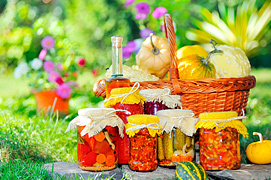 Carol can customize any food preservation topic specifically for your group. Please call her at (618)977-7787 for more information about scheduling a custom food preservation program for your organization or group.